I really hope not to become that parent but I have seen it – a lot. Once the baby is born the older child seems twice as big, thrice as loud, four times as naughty. So without further ado, and in no particular order here are list of recent happenings that have made me very glad we’re going to get one more crack at having a baby around. Because this kid of mine is growing up way too fast. 1. We went on a date this weekend. Of course, we’ve hung out many-a-time just the two of us but I’ve never called it a date and put this kind of spin on it. He took his role very seriously. He held my hand, he opened doors for me and all through the movie he would offer me his drink and say “Care for a sip?”. 3. This one’s not as cute but he’s having a real problem with lying. I know this is a phase kids go through…repeatedly. They seem to circle back to it in their teens so it sort of feels like a flash forward. And the things they lie about – wow. They must think we’re total idiots. Fortunately, I have him convinced now that MOM ALWAYS KNOWS when he’s lying. Yes, son it must be my super powers that tell me you didn’t flush – not the evidence you clearly left behind. 4. His curiosity has exploded. In the last few weeks we’ve had many conversations about continental drift, evolution, sub atomic particles (I swear I am not kidding) and volcanic eruptions. He’s currently fascinated by all things volcano, earthquake, geography or weather related. On the way to the aforementioned movie he asked if, instead of a movie, we could go to the museum and see “those people” from Pompei. Apparently his interest in geography has not yet taught him that Italy is not a quick drive down the road. We recently got him a globe and have since spent several evenings discussing where various animals, places and people are located. We’ve gotten out the flashlight and he now full grasps the whole “night in Australia is day in America” concept and delights in telling me that “Grandma Carol is just waking up now!” when it’s about dinner time here. 5. We recently went through about a solid month of him echewing cartoons in favor of the plethora of National Geographic documentaries on Netflix. For the love of Pete, don’t get him started on venomous snakes. Now he’s on to Veggie Tales which are inspiring conversations of a very different sort…but that’s another story. 6. I remember learning in child development that kids really are not capable of true empathy until somewhere around ten years old. I cannot decide if this is true. He has very sweet and caring moments that make me so proud of him – like when he gives a younger child their way without a complaint. And then there are the other times. Like when he head-butts his dad right in the crotch in the middle of Subway…you know, for fun! 7. He is developing opinions about how he wants to dress and have his hair cut. Right now he’s sporting a Mohawk. We were only barely able to convince him this would be preferable to the reverse Mohawk he really wanted (a stripe shaved out of the middle of his head). 8. He’s getting interested in sports. I bought him a technical shirt that is a miniature copy of the ones Toby wears and he was very excited about it. 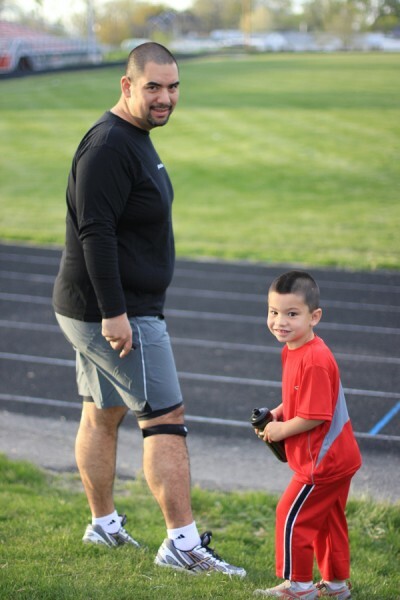 Unlike his parents, he’s naturally a good runner and already has some pretty decent endurance for a kid so small. Last night he paced Toby around the track – someone literally twice his height and he wasn’t breathing that hard. Getting him to focus on running a solid lap was harder. He likes to bolt off and start running stairs instead of completing the lap (show off!). So in the fine parenting tradition, I bribed him with money. I said if he could complete one solid lap I’d give him a buck. He did the lap, asked for his dollar and then ran around again so he could show off his dollar to his dad and the rest of the people on the track. What a great post! I love your stories about him. I think he is actually a 30 year old trapped in a little boys body. “Care for a sip?” Classic!!! This made me laugh! Just last night, me and my honey were watching a documentary about those snakes and I remembered your conversation with Robby. He’s so special that I haven’t even met him and he’s affecting me! He is such a character! Every time you post about him he just amuses me to no end. Volcanoes are cool. I’d be so happy if my child was into volcanoes. But then my children are actually a cat and a dog, so that would be weird. *So happy you didn’t get him get the reverse mohawk! You should show him Hawai’i on the globe and tell him about Mount Kilauea! He would love it! I actually have – he is now campaigning for a family vacation to Hawaii.